Did you stay up all the way to the end of the Dodgers' walk-off win over the Brewers in Game 4 of the National League Championship Series? It took 13 innings and more than five hours to decide a winner -- that honor went to the home team, when Cody Bellinger drove in Manny Machado for the game-winning run in the bottom of the 13th at Chavez Ravine. But how does that marathon compare to the others in MLB's 115-year playoff history? As it turns out, the Dodgers and Brewers don't even rank among the top 10 longest playoff games by number of innings. Here are those games: the 10 longest postseason games of all time. 1 (tie). 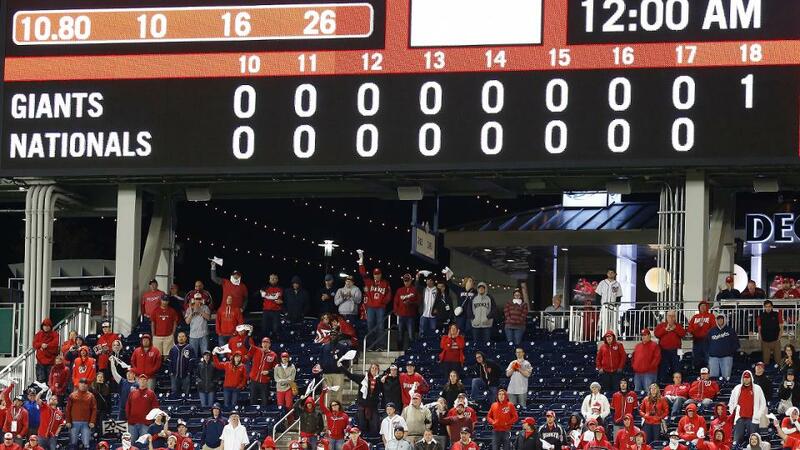 Game 2, 2014 NLDS: Giants 2, Nationals 1 -- 18 inningsThe Nationals have had more than their fair share of agonizing playoff losses in the last decade. This was one of them. The Nats held a 1-0 lead entering the ninth inning in Washington, and Jordan Zimmermann was dominating. The righty had thrown eight shutout innings, and he took the mound for the top of the ninth. He got two quick outs -- giving him 20 straight batters retired -- but then walked Joe Panik. Matt Williams replaced Zimmermann with Drew Storen, who allowed a single to Buster Posey and a game-tying double to Pablo Sandoval. The Giants almost took the lead there, but Posey was thrown out at the plate to keep the game tied. 1 (tie). Game 4, 2005 NLDS: Astros 7, Braves 6 -- 18 inningsEntering Game 4 of the 2005 NLDS, the Astros already held the record for longest postseason game -- their 16-inning Game 6 loss to the Mets in the 1986 NLCS. They topped that one here, with a win that sent them to the NLCS. Their record has since been equaled, but not broken. One crazy fact: Tim Hudson, who started the 18-inning playoff game for the Giants in 2014, also started this one for the Braves. 3. Game 6, 1986 NLCS: Mets 7, Astros 6 -- 16 inningsThis game stood as the record for the longest in the postseason for close to two decades. Like the Astros-Braves contest that eclipsed it, this one was a series clincher. The Mets beat Houston at the Astrodome to move on to the World Series against the Red Sox, setting the stage for one of the most memorable Fall Classics of all time. 4 (tie). Game 5, 1999 NLCS: Mets 4, Braves 3 -- 15 inningsThe Mets won another marathon in the 1999 playoffs, a 15-inning victory against the rival Braves in the NLCS that took five hours, 46 minutes. But there was no World Series trip awaiting them this time, as Atlanta would go on to win the series in Game 6 two days later. 4 (tie). Game 2, 1995 ALDS: Yankees 7, Mariners 5 -- 15 inningsThe late-1990s Yankees dynasty actually began the next year, when they won the first of four World Series in a five-year span. In 1995, Derek Jeter was a 21-year-old getting his first big league cup of coffee, and a rookie Mariano Rivera hadn't yet taken over the closer role from John Wetteland. But the Bronx Bombers were still a playoff team. But Game 2 of the ALDS actually set up a dramatic comeback in the series by the Mariners -- the Yankees' 15-inning win gave them a two-games-to-none lead, but the Mariners would rally to win the final three games in a row to advance to the ALCS. 6 (tie). Game 1, 2015 World Series: Royals 5, Mets 4 -- 14 inningsThe record for longest World Series game is a three-way tie at 14 innings, with the most recent being the Royals' 5-4 win over the Mets in the opening game of the 2015 Fall Classic. The win sent Kansas City on its way to the franchise's first championship since 1985. 6 (tie). Game 2, 2015 ALDS: Rangers 6, Blue Jays 4 -- 14 inningsThe most memorable game of this series was the deciding Game 5 -- the Jose Bautista bat flip game. But before Joey Bats won the Blue Jays the series, capping a comeback from down 2-0, the Rangers pulled out this 14-inning affair on the road in Game 2. 6 (tie). Game 3, 2005 World Series: White Sox 7, Astros 5 -- 14 inningsThe White Sox lost just one playoff game on their way to the 2005 World Series title, going 11-1 in a dominant postseason, including a sweep of the Astros in the Fall Classic. But those wins were hard-fought, especially Game 3 of the World Series, the only extra-inning game the White Sox played during their title run. 6 (tie). Game 5, 2004 ALCS: Red Sox 5, Yankees 4 -- 14 inningsThis game was part of one of the greatest comebacks in baseball history -- the Red Sox's unprecedented rally to beat the Yankees in the 2004 ALCS after being down three games to none. The night before, in Game 4 at Fenway Park, that comeback had begun with Dave Roberts' steal, Boston's ninth-inning rally against Mariano Rivera and David Ortiz's walk-off homer in the 12th inning. 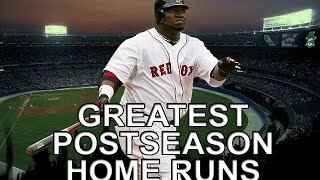 In Game 5, Big Papi did it again. 6 (tie). Game 2, 1916 World Series: Red Sox 2, Robins 1 -- 14 inningsThe Red Sox and Brooklyn Robins -- now the Dodgers, of course -- established the World Series benchmark when they played this 14-inning World Series game all the way back in 1914. No postseason game would go longer for the next 60 years, until the Mets-Astros NLCS Game 6 in 1986. In the good old days of the dead ball era, this game lasted only two hours, 32 minutes.